I was very surprised (and happy) to come across a near mint edition of Monsignor Knox's Holy Bible translation from the Latin (in light of the Hebrew and Greek originals). 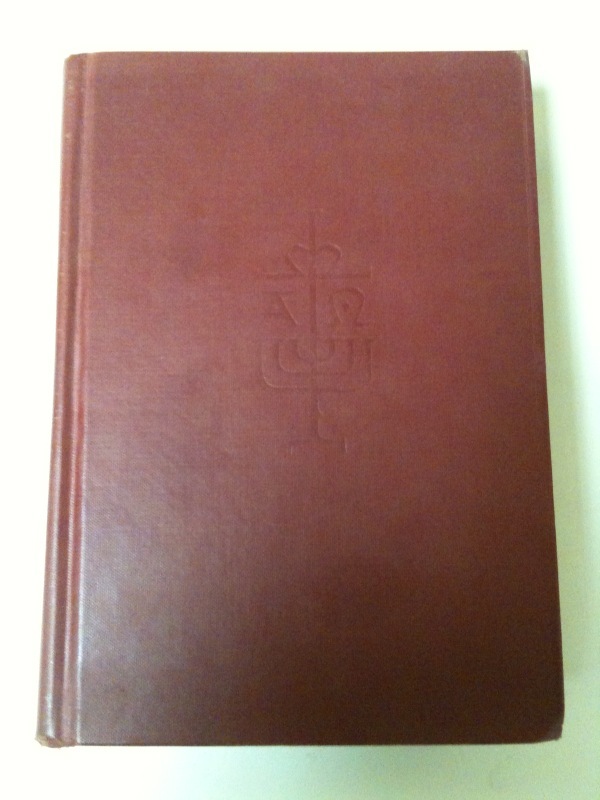 It is the complete hardcover edition, with ribbon marker, maps, and a family record section. This edition was published by Sheed & Ward, Inc back in the early 50's. I know that Baronius Press will eventually be coming out with a new edition of the Knox Bible, but I must say that this is the best condition one I have found. Needless to say, I am very excited to be adding it to my Bible collection. This edition still has the occasional commentary notes, as well as some cross-references found at the bottom of each page. So, maybe I could sell/raffle-off one of my older hardcover edition? For more info on the Knox translation, you can check out the always "reliable" wikipedia site or read a little bit of the Knox New Testament for yourself. Well done -- I must say I admire your skill at catching such a fine volume. Did you find it on eBay or in a used book store or somewhere else? If it is not too much to ask, about how much did you pay for it? I have the three volume edition (and that was pretty chewed up when I bought it), so I am waiting for the Baronius Press edition. Very nice! I'm reading "Life of Christ" by Bishop Sheen, and this is the translation he most often uses in the book. Well, it is the end of the year at school and we are getting rid of or donating some old books and materials. I found it in an old box, among some old Fireside NAB's from the 80's. 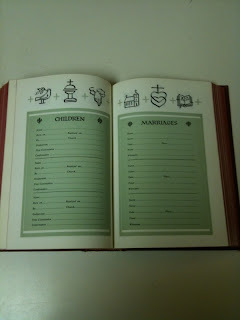 We don't use these anymore, since each student gets their own Bible. I think this use to be somebody's personal Bible, since it isn't labelled like the others and this school, which opened in the 60's, wouldn't have used it. What a great treat to find it, in such good condition. Great! I've seen copies go well above $200 at used book dealers, and in much worse condition. May you use it in good health and may it help you grow even more in Scripture. Behind the Douay-Rheims, the Knox is my favourite! Yes, I thing these are very good days to be a Catholic who loves the Bible (which should be all 1 billion of us). There is a plethora of materials and actual Bible editions out there for the choosing. One must not forget about the forthcoming NABRE, which hopefully be an upgrade, as well as the continued publication of NRSV Bibles. Very good times indeed. 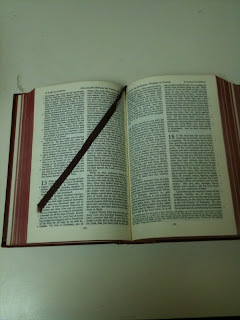 I just checked Ignatius' site, and they are now showing the Ignatius Study Bible (leather) in stock. We'll see how long it takes to get here. I've got a copy of this Bible edition but it isn't in as good condition. I hope when Baronius comes out with theirs that the the font is larger and different. The only difference I can see from these pictures is that on my copy only the top edging of the book is red...not the side or bottom. Its really odd. Matt's comment makes me curious -- would it be possible for you to get a closer or larger photo of a whole page (including the notes)? Also, are the verse numbers in the margin of this edition? I prefer that! What a wonderful find! That's another great Bible to add to the collection, Timothy. I do like the Knox translation. I have a couple of different sized hardbacked NT's, and a three-volume, complete Knox bible, which I actually bought from the monks of Prinknash Abbey, where I'm an Oblate. 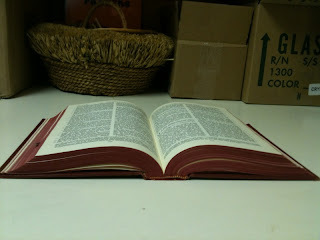 These three volumes, like Matt's, have a red top-edge and are plain on the other two sides.